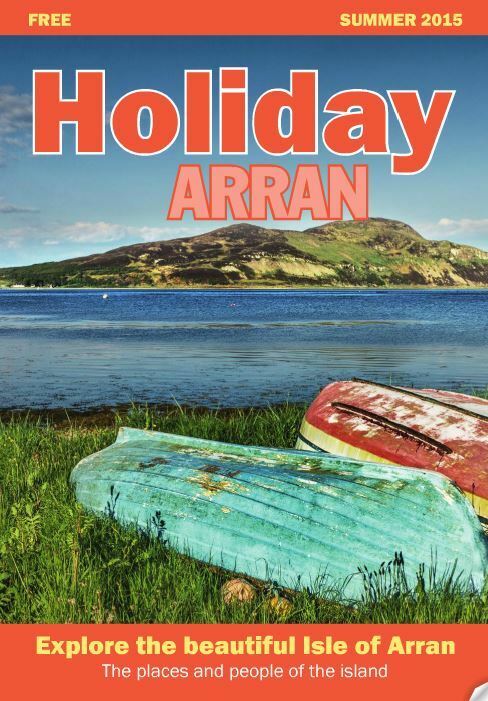 You can read our publication “Holiday Arran” online by clicking here or on the image below. It will not open in and Ipad or Iphone as they do not operate Adobe Flash Player. If you are thinking of an ideal, get-away-from-it-all holiday, short break or even a long weekend on the west coast of Scotland, then look no further the Isle of Arran has it all. Action-breaks, climbing, sailing, fishing, golfing, hill-walking or simply relaxing in peaceful bliss “ everyone is catered for. Spectacular ‘Highland’ style scenery amid misty hills and glens, lovely ‘Lowland’ type moorland and lush pasture where wildlife abounds “ all are neatly packaged within the most accessible of all the Scottish islands. Rich in history, yet modern in outlook, Arran enjoys all-year round short ferry links with Ayrshire and Scotland’s Central Belt â€“ less than one hour’s drive from Glasgow, and less than one hour’s sail from the Firth of Clyde port of Ardrossan. This island paradise is also close to the golfing Meccas of Troon and Turnberry and there is a shorter 30 minute sea crossing to the Kintyre coast and the excellent Argyll links golf courses such as Machrihanish ‘ but with Arran boasting seven wonderfully scenic courses within its 20-mile length, golfers may never want to leave. Arran is a condensed version of the best that Scotland has to offer; golf courses, castles, distillery, museums, outdoor activities and gourmet food. It is the seventh largest Scottish island nestled in the Firth of Clyde between Ayrshire and Kintyre. Have you played Arran yet? The Isle of Arran boasts the greatest number of golf courses per population in the world and has become known for its challenging but fair courses that are all open to non members. The island’s seven picturesque courses reflect the beauty and diversity of the whole island and, with an island population of around 4,700, there is one course to every 671 islanders. You would not be surprised then, to see the fairways and greens filled every summer with golf enthusiasts from around the world. And, outwith the regular tourist season, every club boasts a healthy membership. Most people’s first view of Arran is the east coast with its towering mountains rising up towards the north. The east coast of Arran is home to the three bigger villages on the island, Brodick, Lamlash and Whiting Bay. Brodick is usually the first port of call as the car ferry MV Caledonian Isles from Ardrossan docks here. Sailing into Brodick Bay you are greeted by one of the most beautiful views of Arran; the long sandy beach sweeping up towards Goatfell, and the impressive sandstone bricks of Brodick castle. The modern village of Brodick has grown and expanded over the years. Arran’s first pier was built here in 1872 and the Golf Club celebrated its Centenary in 1997. Brodick Hall was opened in 1895 with money raised by the Brodick Public Hall Company Limited. Generations of visitors and locals cherish fond memories of that old hall which is still the venue for concerts and dances and community activities, with the added bonus of the new library. LAMLASH is just three miles south of the ferry terminal at Brodick. The village is situated in a sheltered bay protected from the elements by the Holy Island rising a thousand feet out of the sea. In 1263 before the Battle of Largs, the Norse king Haakon anchored his fleet in Lamlash Bay. On the Holy Island the cave of Saint Molaise, who lived and died here in 639AD after accepting 30 diseases at once to avoid purgatory, has runic inscriptions, which may have been made by Viking sailors at this time. The natural harbour is a haven for boat users and fisherman alike. Underwater enthusiasts can visit the Derwent shipwreck in the bay, dating back to 1880. Lamlash is the site of the only secondary school on the island, Arran High School and the Police station. Here you will also find a number of good pubs and hotels as well as a smaller Co-op shop selling all groceries. Lamlash Golf Club is perched on a hill as you travel into the village. THE WILD north half of Arran spans from the pretty village of Corrie across the mountains to Pirnmill, which overlooks Kintyre. Miles of unspoilt scenery and striking wildlife are there for all to see. Corrie is situated six miles from Brodick. It has a pretty procession of cottages lining the road to Lochranza and wrapping themselves around a picturesque little harbour. It lies under the island’s highest mountain, Goatfell, and a path provides access to the hillside. The village used to be a regular stop for steamers travelling around the island, but the pier has since fallen into disrepair. Its one pub, The Corrie Hotel, has an informal and pleasant atmosphere offering good food and friendly service at reasonable prices. Open all year round, treks take place through scenic countryside and total beginners are welcome from the age of five upwards. As you drive on the road over the Boguillie hill you will see some of Arran’s most fascinating wild life. Herds of deer roam the hilltops while above you there is the chance that you’ll spot a Golden Eagle. Hidden at the bottom is arguably one of the island’s most beautiful villages. Lochranza is surrounded on three sides by high imposing mountains and in the middle of the bay is a fine ruin of a 13th century castle. The village is the most northerly sited of all Arran’s villages and is located in the north-western corner about 14 miles from Brodick. The village has been celebrated in verse by one of Scotland’s finest writers, Sir Walter Scott: ‘On fair Lochranza steamed the early day, Thin wreaths of cottage smoke are upward curl’d From the lone hamlet, which her inland bay And circling mountains sever from the world.’The Lord of the Isle. AS YOU travel on down the coast from Pirnmill the views of the Mull of Kintyre and the North of Ireland are breathtaking. Following the road high above Whitefarland past the charming Imachar farm visitors can see for miles on a fine day. As you drive south you will see the magnificent Dougarie lodge on your left. This imposing white house hidden in Glen Iorsa was once the summer residence of the Duke of Hamilton. On the beach there is a delightful old boathouse leading down to the beach. It may be small but this is one of the west coasts loveliest beaches, plus there is a handy changing hut to protect one’s modesty. A little further round the coast is Machrie, which is little more than a wide cluster of houses surrounding a charming golf course. This flat seaside course sports nine holes and is 2200 yards. MANY argue that the most peaceful area of Arran is the south of the island, compromising the villages of Kildonan, Kilmory, Lagg and Sliddery. They share some fantastic beaches; big sandy bays as well as interesting rock pools. Kildonan is unusual in that it lies a short distance off the main road overlooking the small island of Pladda. Down south you will see the floating volcano Ailsa Craig, a bird sanctuary with an unmistakable outline. The name Kildonan derives from the name Saint Donan who is reputedly buried in the village. Early life in the village revolved around Kildonan Castle. Once a royal seat, the castle passed between various Scottish nobles, before latterly belonging to the Hamilton family in 1544, by which time they were the earls of Arran. The tower was later sacked and burnt by the Earl of Sussex around 1558. The ruined remains of the building still exist. The modern village is a small thriving community with a much loved and much used village hall. There was a school in the village but numbers declined so much that it closed in 1968.